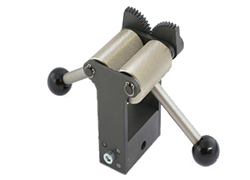 Eccentric roller grips for flat samples such as rubber, plastic film and paper. Eccentric roller grips are ideal for all types of flat samples such as rubber, plastic film, plastic dumbbells, paper and cardboard, sheet metal and foils. We offer a range of self-tightening eccentric roller grips where the grip tightens as the sample is pulled.